Shanthi Seshadari shared her recipe for South Indian Coconut Chutney at the 2nd What’s Up Chef cooking demo. Coconut is a popular ingredient in South Indian cooking and South Indian coconut chutney makes the most of it. This mild chutney is not just the perfect companion for idlis, dosas. Medu Vada and Masala Vada. Coconut chutney is best made and eaten fresh. Making coconut chutney is really simple; just blend fresh coconut with chillies, ginger and temper with mustard seeds. However this recipe’s real taste diffrentiators are the cashew nuts, roasted chana dal, urad dal, tamarind and curry leaves. Follow this recipe for an addictive chutney. Mix all the ingredients in the blender until it forms a fine paste. Make tempering of Mustard seeds, Urad Dal, hing or asafoetida, and curry leaves in hot oil. Add the fried spices on top of the chutney. 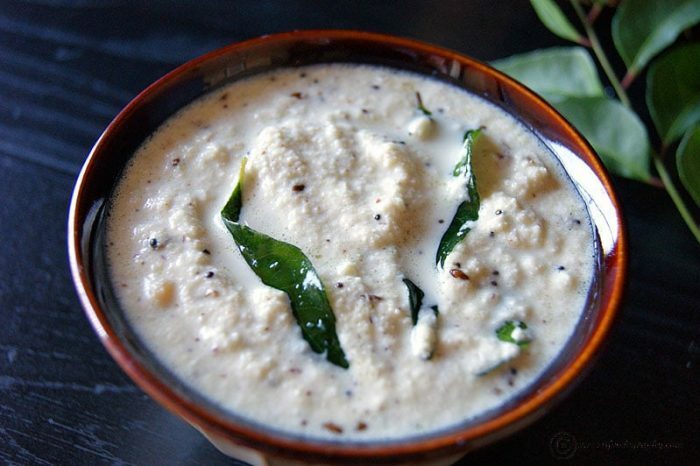 Your coconut chutney is ready to serve.